SubRosaSoft, Ltd., a software company based in New Zealand focusing on disk utility and privacy software, announced the availability of SubRosaSoft DiskGuardian 2.0. DiskGuardian is a collection of tools that alert users of imminent hard drive failure in addition to performing volume repairs, backup and restore, benchmarking, surface scanning for media defects, and verification of data integrity on storage subsystems. "DiskGuardian utilizes a feature called Self Monitoring Analysis and Reporting Technology, or SMART, that is built into most modern hard drives to monitor and alert users before the drive starts to fail," explained Marko Kostyrko, SubRosaSoft's founder. He continued, "DiskGuardian will alert the user on screen, with sound, by email, by updating your personal web server, or FTP to a destination of your choice. This allows users to respond before their data is lost no matter where they are." "DiskGuardian not only predicts problems before they occur but can diagnose and repair disks as well," explained Ben Slaney, co-author of DiskGuardian and author of FWB SMART Toolkit. "It includes a comprehensive suite of tests for the physical media of the drive and the drive subsystem. Tests can be set to run for extended period of time to determine consistent performance of a storage subsystem. The tests analyze the overall integrity of the transfer data by writing, reading, and comparing the data. And if you do have a problem with the drive data, you can use DiskGuardian's Volume Repair feature for repairing most faults." DiskGuardian also features the ability to backup a partition to an image and restore the image to create a volume identical to the original. "DiskGuardian Backup/Restore is a tool to backup and restore every block on your disk." Marko Kostyrko explained, "Unlike other backup systems, SubRosaSoft DiskGuardian can even backup many disks that are known to have physical faults. For example, scratched CDs and disks with bad blocks." "And for the performance-oriented users, Disk Guardian includes a benchmarking feature for measuring the performance of hard drives under different types of test and load. The Benchtest feature gives the user the ability to make sure the drive is up to par for usage. The test results can be exported either as a text file for detailed analysis, or a JPEG file which users can easily post online," concluded Marko Kostyrko. SubRosaSoft DiskGuardian 2.0 is now available at the manufacturer's suggested retail price (MSRP) of $69.95. Competitive upgrades are available. Utilities such as Drive10, TechTool Pro, SMART Toolkit, Norton Utilities, and Disk Warrior all qualify for the $54.95 crossgrade. SubRosaSoft DiskGuardian 2.0 requires Mac OS X 10.2 or higher. SMART feature requires internal IDE drives. CharisMac announced support for Apple's new digital audio format, AAC (Advanced Audio Coding) in their Discribe V5.0.36 CD/DVD burning software. Music purchased and downloaded from Apple's new iTunes Music Store is stored in the new format. Users can now simply drag and drop AAC tracks over the Discribe interface in order to burn the files to a standard audio CD that can be listened to in all car and home audio CD players. Converted files can also be saved to the user's hard drive in AIFF format for future use. Using any iTunes Music Store authenticated machine, a user may purchase a song from the iTunes music store and then burn the downloaded file to CD using Discribe. Discribe V5.0.36 requires OS 10.2.5 or higher as well as QuickTime 6.2 or higher. Prior to adding support for this new file format, Discribe users could only burn songs to CD from Apple's iTunes. When burning songs through iTunes, the purchased files can not be saved to the users hard drive as AIFF files. Using Discribe, the customer can convert them to AIFF and then save the file for future use. Discribe V5.0.36 is available for $69.95 directly from CharisMac Engineering. A demo version is also available on the CharisMac website. The demo version allows users to burn up to five CDs. Upgrades from previous versions of Discribe are available for $39.95. Competitive upgrades from any competing CD burning packages are also available for $39.95. If you work on the road, you want a second battery for your PowerBook. These batteries are the ideal spare or replacement for your G3 PowerBook. The new MCE DVD-R/RW "SuperDrive" upgrade for the iBook (Dual USB) allows iBook owners to author professional-quality DVDs as well as create, store, and share their collections of videos, music, and photographs. Plus, the fast, highly reliable drives are compatible with most computer and set-top DVD video players and other DVD burners - so video and data DVDs created using these drives can be shared with business associates, friends, and family. The MCE DVD-R/RW "SuperDrive" upgrade must be professionally installed into your iBook (Dual USB) by us, or at one of our worldwide MCE Authorized upgrade centers. Once installed you'll be able to easily record up to 4.7 GB of data, video or audio onto recordable DVD discs right from your iBook! Ships with DVD Authoring software for your iBook for creating Video DVDs and Video CDs. DVD Authoring Software compatible with Mac OS 9.x only. Customers who purchase now will also receive a free copy of the Mac OS X version set to be released May 1. Other World Computing (OWC) has expanded its popular line of Mercury Elite external FireWire (1394a)/USB 2.0+1.1 combo storage solutions with the introduction of a 320 GB model priced at $459.99. Additionally, OWC reduced prices on all of the company's Mercury Elite external FireWire/USB storage solutions, with the exception of its 250 GB 7200 RPM model with 8 MB cache memory that debuted in March. The new prices are from $10 to $50 lower and constitute reductions of up to 14 percent. New pricing for the Mercury Elite FireWire/USB combination drives range from $149.99 for a 40 GB 7200 RPM model w/2 MB cache up to $339.99 for a 200 GB 7200 RPM model w/8 MB cache. "Technology continues to progress at an extremely quick pace, which makes the introduction of this 320 GB storage solution and these price reductions possible," said Larry O'Connor, president of OWC. "Advancing technology translates into better products appearing in the marketplace. It also means the high-quality technology already on the market is becoming much more affordable." Also new from OWC is a 250 GB 7200 RPM model, which is being introduced at $439.99. Each Mercury Elite drive measures 1.5" x 9.0" x 5.5", weighs less than three pounds, and ships with Intech HD SpeedTools, a FireWire cable, an external power adapter, and a two-year OWC warranty. The drives are compatible with Mac OS 8.6 and up as well as Windows 98, 2000 and XP. Mercury Elite FireWire/USB combo drives are available exclusively from OWC. It's called the Slim, and it's here to protect your Apple PowerBook. 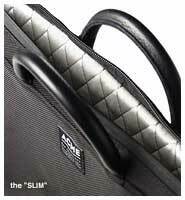 The Acme Bags Slim is designed to be thin enough to fit within your daily bag or carried on its own. It's here in 12", 15", and 17" sizes - designed protection. 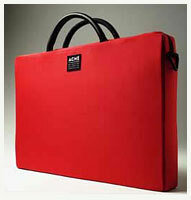 The Slim is Acme Made's new bag/sleeve hybrid designed specifically for the Apple PowerBook line of laptops. The streamlined design allows the Slim to be inserted into another bag or carried with or without it's removable shoulder strap (included). While minimal in design, the Slim maintains a high standard of protection utilizing closed cell foam, high impact plastic, "Splash-proof" zippers and a quilted lining all encased in a water-resistant, ballistic nylon shell or designer textiles . Constructed entirely in the United States. Warranted for 1 year. The iBook 12" fits within the Slim 12" model. The Slim sells for $79.99 to $94.99. The Designer Slim sells for $129.99 to $149.99. Willow's Somerset laptop backpack briefcase is designed for those with shorter backs or those who want a more compact case. The Somerset carries your laptop and accessories, up to three inches of letter sized paperwork and features our convenient outer organizer pocket system. Properly, securely, and safely fits many large display laptops such as the 14" iBook, NEC Toughbooks, Dell Latitudes, Toshiba Portégé, and ThinkPad 240, among others. Pricing: $215 Cdn., $153 U.S. The SportFolio laptop case offers rugged, high-tech neoprene construction with a built-in plastic shell for impact protection. The exterior features an easily accessible front pocket, a back zippered pocket and a vulcanized rubber bottom and sides for a secure grip. 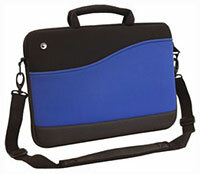 The case zips closed to hold its contents securely. The all-black interior features a soft, plush fabric, and a large pocket. 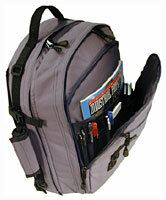 A removable black shock-absorbing shoulder strap is included. All in all a great combination of features that make this case stand out from the crowd.